Valentine’s Day may be a loaded occasion for you. Maybe you have children to love on but your spouse has emotionally left the relationship. Perhaps you lost a loved one recently. You may be waiting for that special valentine in your life to ride in on Cupid’s arrow. Maybe the day is one of dread for you whether or not you receive valentines. Well, there is a valentine we’ve all been sent. It’s God’s Word, which John says is Jesus. In the beginning was the Word, and the Word was with God, and the Word was God. He was in the beginning with God. All things were made through him, and without him was not any thing made that was made. In him was life, and the life was the light of men. The light shines in the darkness, and the darkness has not overcome it. Our biggest #Valentine? #John1_1. "In the beginning was the #Word, and the Word was with God, and the Word was God." When we open it, do we, like the recipients of Little Man’s valentines, hear the Author’s voice? Can we see the heart behind the actions? Are we growing close enough in relationship with Him that we can hear His heartbeat in the words of every book and chapter? How it has beaten from the beginning of time for us? How it has longed to bring us into eternal relationship and life with Him? For God so loved the world, that he gave his only Son, that whoever believes in him should not perish but have eternal life. For God did not send his Son into the world to condemn the world, but in order that the world might be saved through him. In both the Old Testament and New Testament, God’s love for His people comes through loud and clear as He set them apart to worship Him and to bestow His benevolence upon them. When they had eyes for other idols, they forfeited the blessings and protection offered under His wings. He will cover you with his pinions, and under his wings you will find refuge; his faithfulness is a shield and buckler. The Bible is the ultimate #love story—complete with relationship drama, war, betrayal, loss, sacrificial love, reconciliation, etc. It is the #Bridegroom wooing the bride from start to finish. For I feel a divine jealousy for you, since I betrothed you to one husband, to present you as a pure virgin to Christ. Let’s take a look at what I said earlier about batty valentines, and instead of Little Man and I, insert God’s name in there. I started thinking about the great lengths God went to in order to best represent His interests to the recipients. How He found the right pictures (word stories, parables), communicated mild humor (as one example, Baal on the toilet—Bible potty humor!—made you look! ), chose words that sounded like something He would and did say in person, and offered some education along the way. It was important to God to represent Himself honestly. He didn’t want to convey just any message. He wanted to remain true to Himself. And when His children open that valentine, many of them will not even need to turn it over to see its Sender. It will look and read so much like God, that anyone who truly knows Him, or is His daily companion, will recognize the Author’s voice. When you read God’s valentine, the Bible—manifested in the fulfillment of His Son sent to earth—do you hear His voice calling to you, His beloved? This #ValentinesDay, I hope you hear the deep, resonant voice of the Father who sent you a huge volume of love in His Word and through the blood of His Son spilt on the #cross for you. He awaits His bride at the altar. *This blog was first a featured column at Your Tewksbury Today. **It has also been shared at any link highlighted here: Mom 2 Mom Monday Link-Up, Make a Difference Mondays, Worshipful Wednesdays, Women With Intention Wednesdays, Grace & Truth, A Little R & R, RaRa Link-Up, Me, Coffee & Jesus, Dance With Jesus, Blessing Counters, Breakthru Link-up, Saturday Soiree, Tell His Story, Find Stability, So Much at Home, Faith-Filled Fridays, Reflect His Love and Glory Link-Up, Bonbon ‘n Coffee Linkup, Sunday Thoughts Link-Up, and Christian Mommy Blogger. 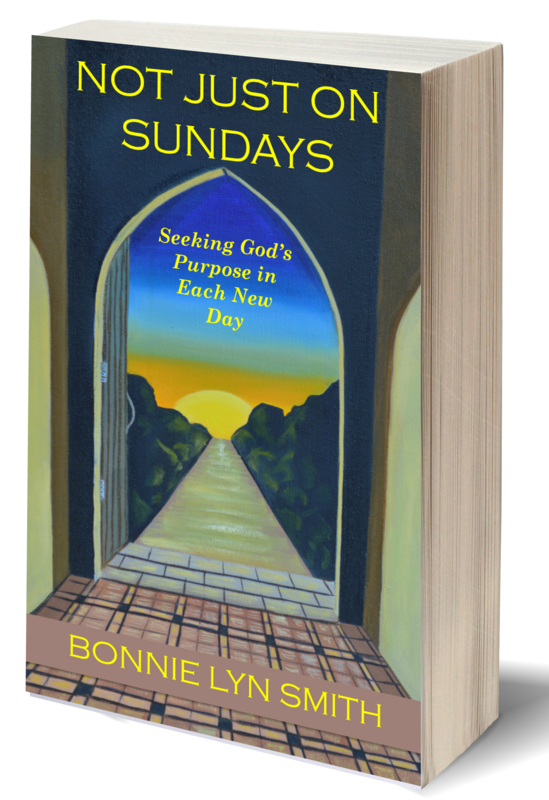 Anecdotal stories about an everyday relationship with God can be found in Not Just on Sundays: Seeking God’s Purpose in Each New Day (includes Book Club Discussion Questions). Thanks so much, Donna! 🙂 Blessings to you! And thanks for your reflections here at Espressos of Faith!